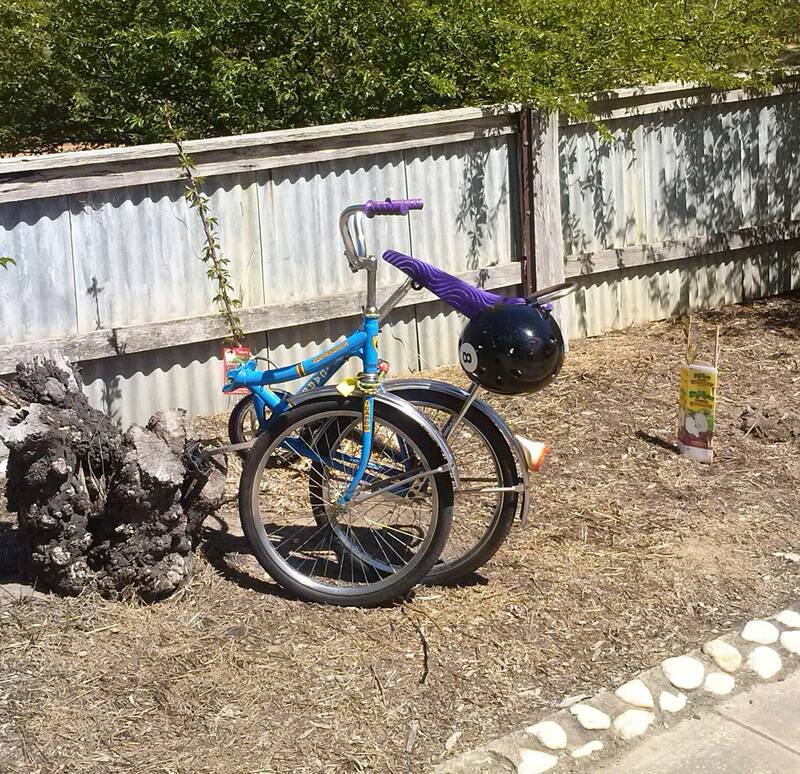 Ever since I became the proud owner of a lime green 1970s Gitane folding bike (not pictured) I started noticing retro folding bikes, or cute little bikes that look like you could fold up them if you tried hard enough, all over my little inner city suburb of Fitzroy. Starting with three in my street! So I started snapping them on my phone. What to do next? Blog them perhaps? Why? I am not sure? I think I am secretly hoping that I will find out more about the bikes. If you know anything, or you see your bike on this site…tell me more. PS. I have now been going over a year and I still get a kick out of it. I (nearly always*) leave a calling card on a bike that I photograph, inviting the rider to visit the site and tell us about their bike, and I get the biggest kick when they do. I have decided Little Bike Blog’s raison d’etre is to pay homage to the little retro bikes and their riders. * I say nearly always because I only carry a few in my wallet at a time, and sometimes I find I’ve run out. If you discover your bike here and you never got the card, tell us something anyway. Bike provenance is my joy. NOTE: Little Bike Blog is now retired as a regular blog, but remains a site for little bike lovers to peruse and comment on an idiosyncratic collection of little bikes. Enjoy. What a cool blog, and i love your commentary almost as much as i love the bikes!! thanks for stopping by my blog too. Loving your blog and whimsical commentary on the bikes you document as if they are all your long lost friends. aw – i’ve gone all warm and fuzzy. Love your blog about the little bikes. I found my Peugeot folder on the hard rubbish and restored it to its former glory. For pics,go here. Great blog – I’ve put it on my favourites list too, as I am now fascinated with small wheels since recently restoring an early 90s 16″ wheeled Dahon. They’re so much fun ! 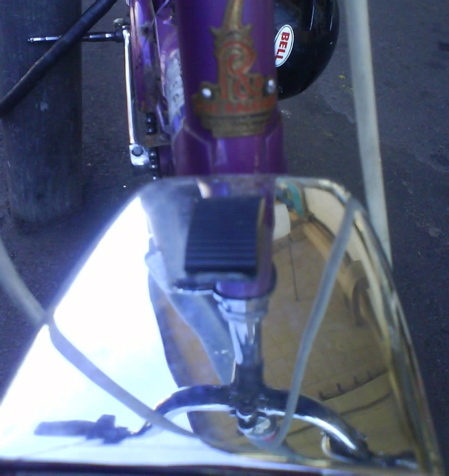 Thanks Rusty Bike Bell, had a squizz at your site, particularly the Dahon – snazzy. Is a friction dive one of those uphill assistance gadgets? That’s what I thought, I saw one on The Inventors once and have been keeping it in the back of my mind for my dotage when the hills get too steep. looking forward to seeing it posted on your blog. Look at the tiny Speedwell I saw today – a Brownie 24 – ever heard of them? Hey there,LB blogger. Seen in Toorak road the other day,a National ‘Jeans’ model. Not much use on my blog but will send to you, the expert on LBs if you like. I’m a luddite~how do I send you a pic? 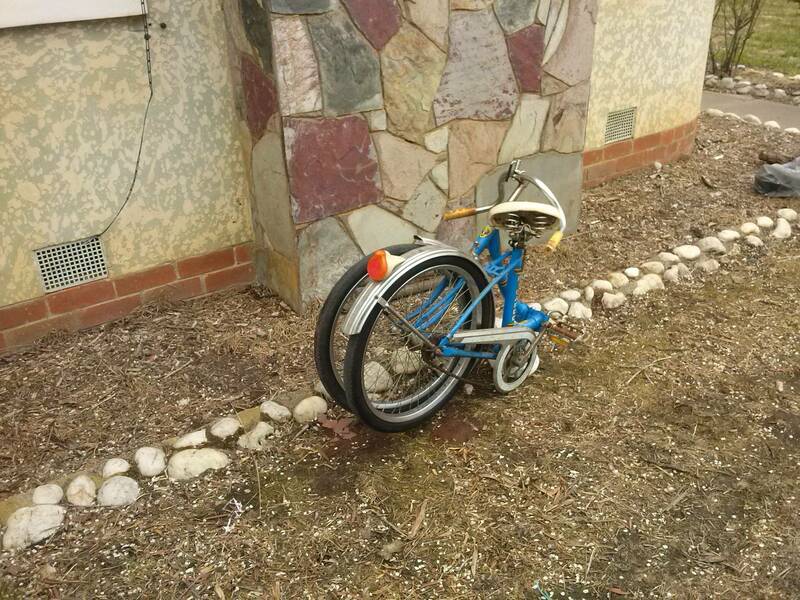 Hey, How does another fanatic about folding bikes send you pictures and a story for your blog? Just found a Gitane folding bike on the scrapyard, its green! did you ever do it up? 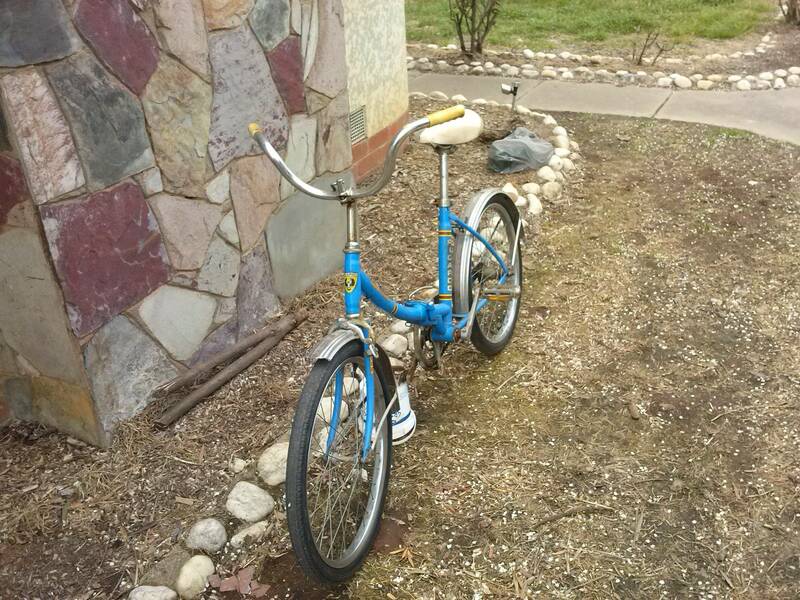 Thanks CJ, love hearing from my select few readers, it gladdens my little bike loving heart. Love your post by the way, you and your NS22 have a nice thing going on. Hey, wanna see my Ricardo Delux folding dragster? Hello. 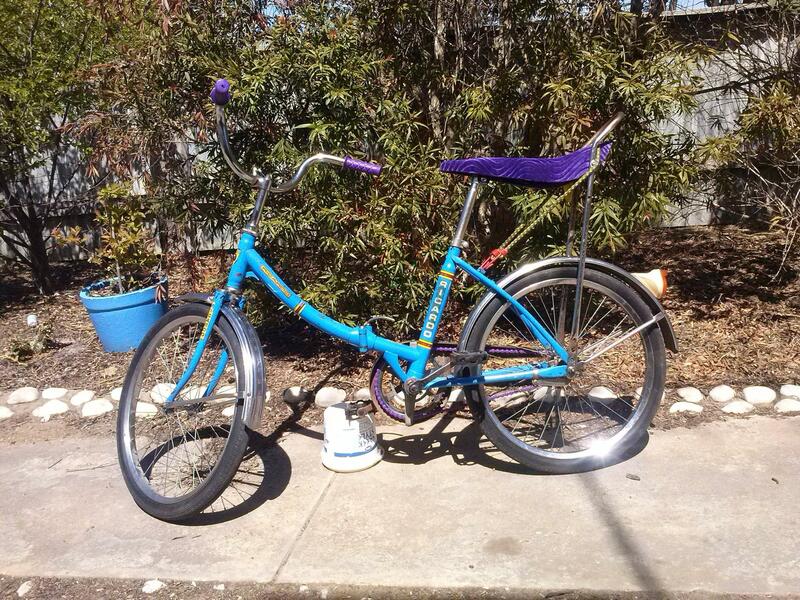 I purchased a very vintage bike at an op shop and I am curious as to what it is. It has a bar cover that says “hotfoot” but that is all I know. Its very cool. I have a photo to send if that’s possible. Thanks for your help. I would love to be able to help but Little Bike Blog is no longer an active blog, I leave it live as an archive. Perhaps you could try this guy https://rustybikebell.wordpress.com/ who knows a lot about vintage bikes. I hope you find out more about your bike and thanks for visiting.